Frappuccinos are the ultimate Starbucks indulgence. They are full of calories and they also cost a fortune (for something that is mostly ice!!) BUT, when you make them at home, you can control the calorie content and they are far more cost effective. They still might be an indulgence, but at least it's one you can feel better about because you made it yourself! This recipe makes a whopping 8 frappuccinos. Now I personally cannot drink 8 frappuccinos in one sitting, nor are there enough people in my house to enjoy said frappuccinos. So I found out that they can be frozen in mason jars, thawed, and enjoyed when you want! If you are freezing the frappuccinos and are ready to thaw them, just take them out of the freezer and leave them someplace warm for about 20 minutes. It's great to do this as you are getting into the shower or are doing some other morning routines. By the time you are ready to run out of the house with your grab and go breakfast, just grab a large straw, stir the frappuccino a bit and it will be back to its original glory. The sugar will settle, so make sure to mix it up well! I love using vanilla beans in this recipe, but if you don't have them on hand, just use a little more vanilla extract. You can also substitute a little chocolate syrup and chocolate chips for a mocha chip frappuccino. Or use caramel syrup for a caramel frappuccino. But, there is something so delicious about the flavor of vanilla with coffee! The sweetened condensed milk means you don't have to worry about dissolving any sugar. It's the perfect easy way to add sweetness! You want to make sure to brew extra strong coffee because all of the milk and ice will dilute the coffee flavor. It's best to brew the coffee the day before and let it chill in the refrigerator. Brew the strong coffee and let it chill. Use a refrigerator or freezer to speed up the process, or just let it chill in the fridge overnight. Add the strong chilled coffee, milk, and sweetened condensed milk to a blender. Blend until smooth. Serve with whipped cream. 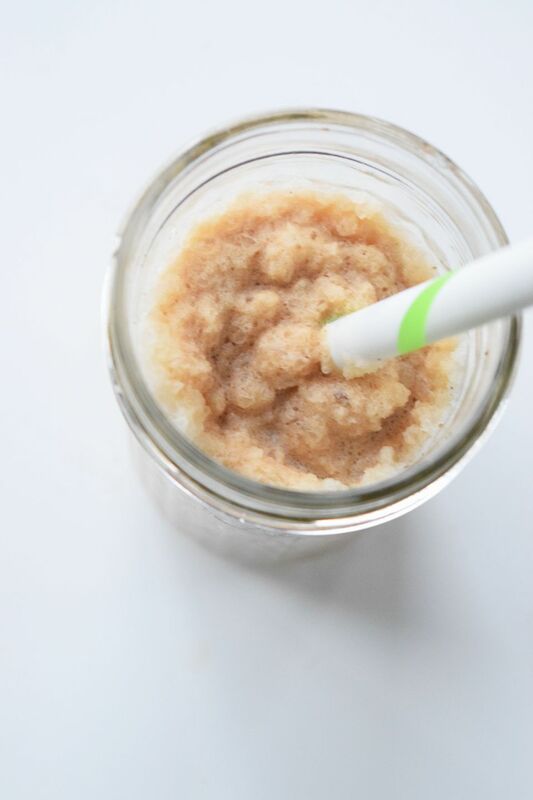 Frappuccinos can also be frozen in mason jars and kept in the freezer for up to 3 months!